For someone who hated ramen for most of his life, Yuji Haraguchi has ironically staked out his place in New York’s culinary scene with what else – ramen. 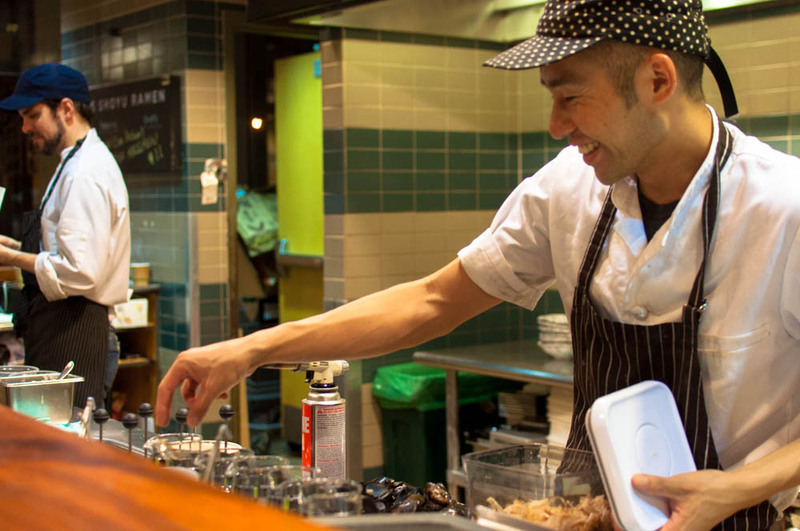 Determined to make a version of the beloved ubiquitous noodles that even he will appreciate, Yuji drew on his experiences working at Roberta’s and as a fishmonger in New York. The result was an unique and creative variety of mazemen, a brothless ramen. 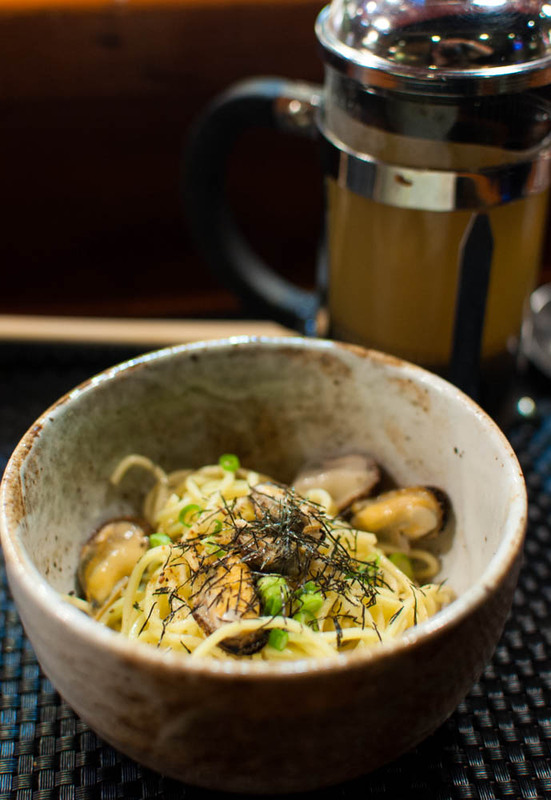 Earlier this year, Yuji opened what was suppose to have been a temporary station on the second floor of Whole Foods on Bowery to show case his mazemen in a seafood-centric tasting menu. The demand for his tasting was so high that the seats sell out within minutes of being posted on their Facebook site. And now, Yuji Ramen is a permanent fixture at Whole Foods and has a second location and cookbook in the works. In addition to one nightly seating for Yuji’s tasting menu, you can also order a few favorites a la carte. 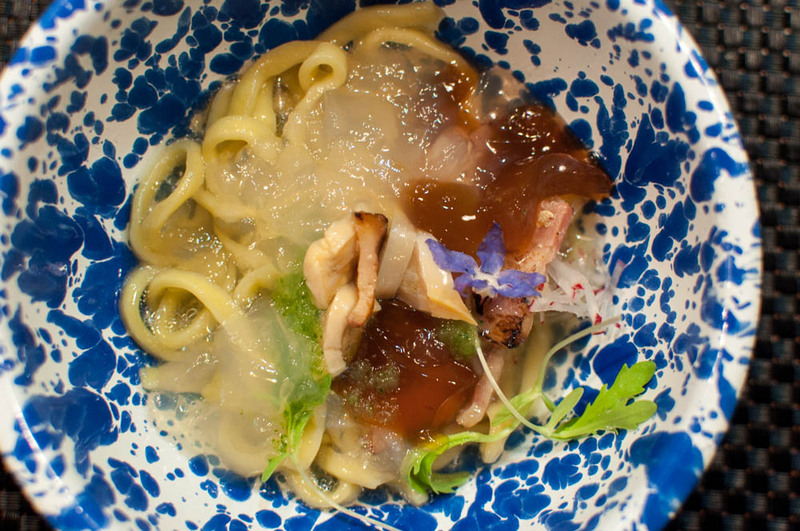 Having tasted Yuji’s delicious bacon and egg ramen at Smorgasburg, I knew that I had to give the tasting menu a try. After weeks of trying hard to secure two seats, I finally came across a single opening one Friday night in October and without thinking twice, I booked the one seat for a date with myself at Yuji Ramen. Friday night came and I arrived on time at the Bowery Whole Foods to find my seat at the bar waiting for me. I was a few minutes late so I had to catch up. Good thing the others were merely just finishing up with a starter of pickled vegetables. A pick-me-up for the palette, these were crunchy with a perky vinegar bite. 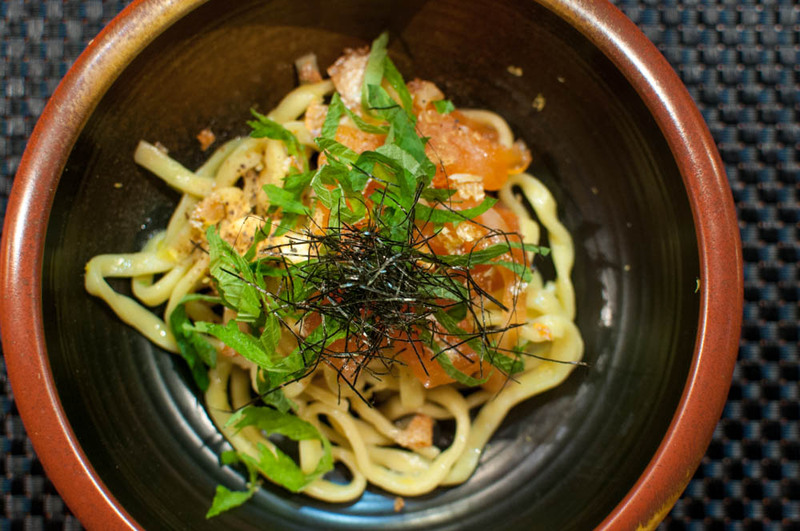 The first ramen dish of the eight course tasting menu is a perennial favorite of Yuji’s creations, the salmon ramen, an ode to the New York classic of lox and cream cheese. House cured salmon ramen was topped with a soft creamy Camembert cheese, lemon, and shiso leaves. Even though cheese and salmon combination might seem a little strange, the cheese created a creamy sauce that coated each strand of the al dente noodles and the lemon shiso kept everything light and bright. I can definitely see why this is a classic that will always be a part of the collection. 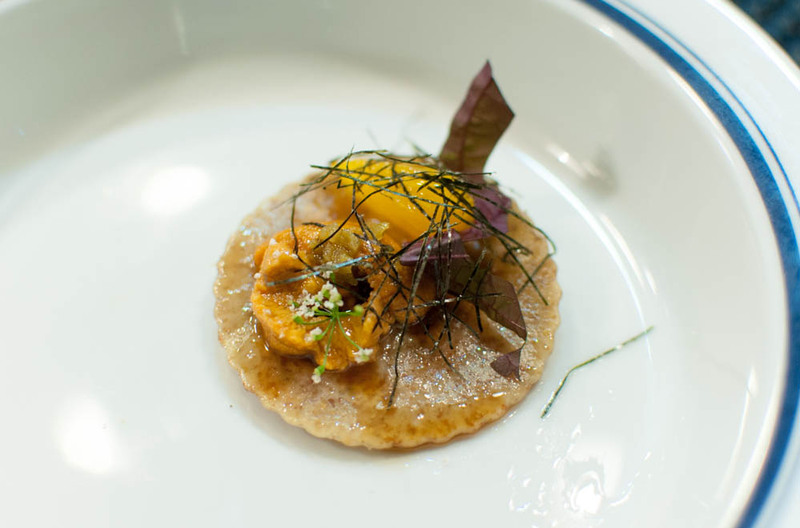 The next dish transformed the ramen dough into a ravioli filled with sea urchin and topped with more sea urchin. Finished off with a sweet soy and nori orange sauce, the combination was strangely herbaceous. Like many others, I made the mistake of calling the dough pasta and Yuji patiently smiled and corrected me. “Ramen, not pasta”. He then went on to explain how he developed his version of the ramen dough and how it differs than pasta. Not only can Yuji’s ramen dough be transformed into a pliable dough for ravioli, it can also be used to create a shell pasta. 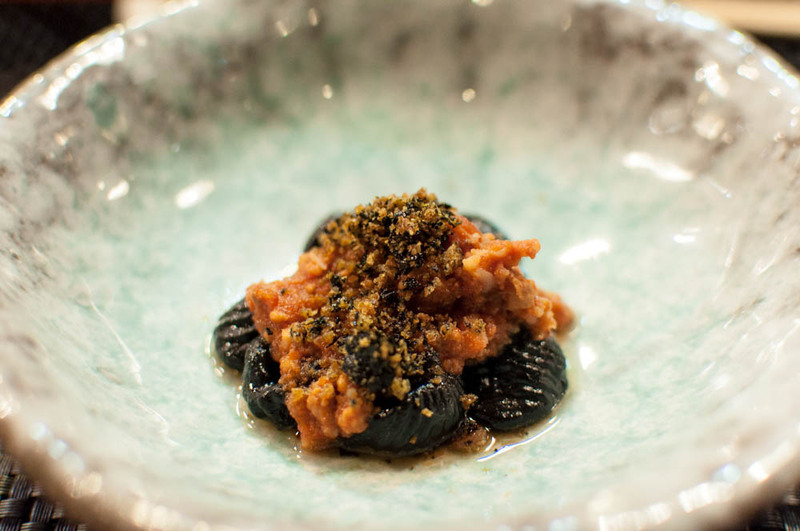 The squid ink shell is served with a mildly spicy ragu made from locally source squid. The squid was ground and cooked down with tomato and the dish was topped off with a little bit of nori bread crumb. 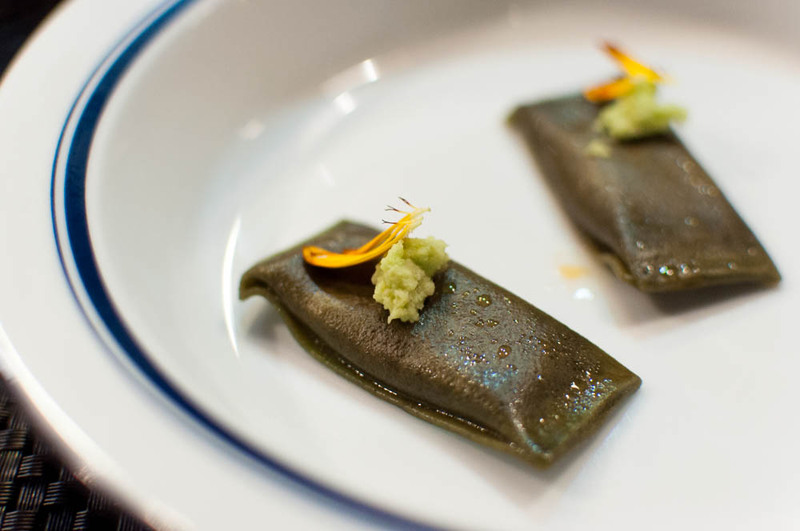 The next dish stretched the use of the ramen dough even further (as if that is possible!). Fried ramen cracker dough was rolled out into sheets and deep fried. 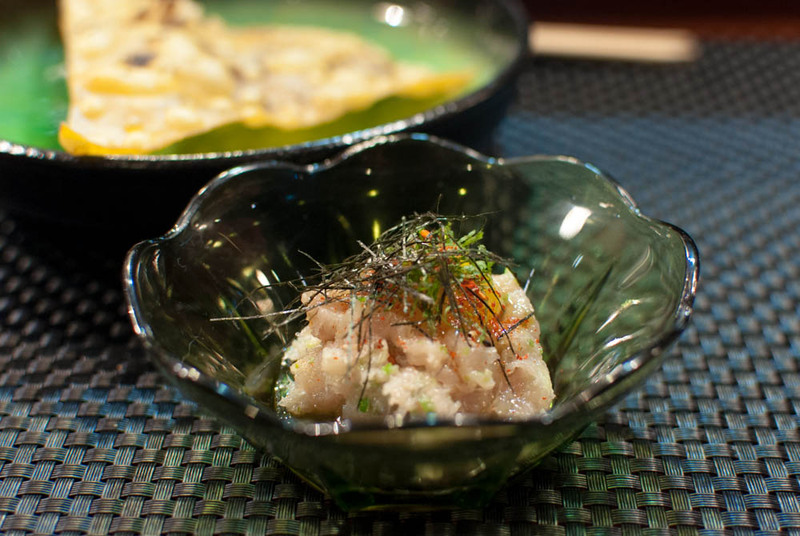 The crispy chips were topped with a dash of roasted kombu powder and served with a tartar of Long Island Spanish mackerel. The refreshing tartar which changes daily was creamy and light with a ginger shiso dressing and egg yolk. After deviating from the most common form of ramen noodles, Yuji brought it back, all the way back to a broth based ramen noodle dish. 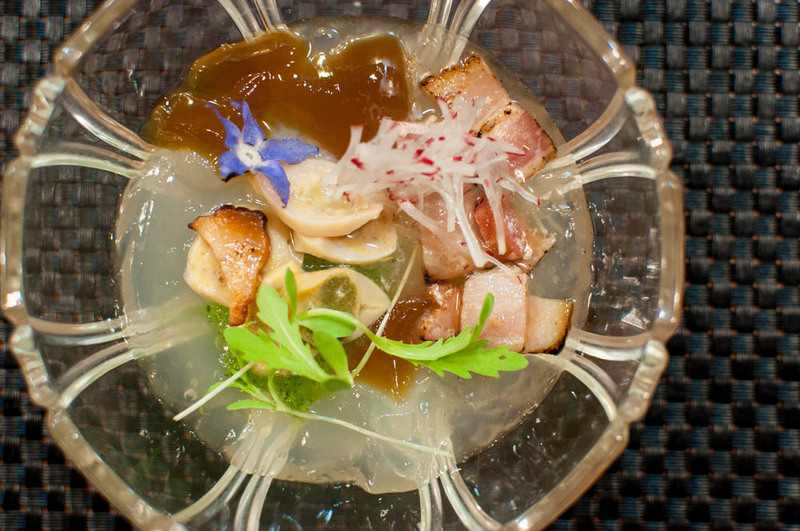 We were initially presented with a small bowl of clam and bacon broth jelly with ponzu, pureed cucumber and chrysanthemum blossom. So delicate and beautiful, we were told to pour the entire content of the bowl into a piping hot bowl of ramen that came next. The heat from the ramen melted the broth jelly into a lovely broth and the result was a delicate seafood broth that packed a perky punchy from the ponzu sauce. Just as we were still reveling over the uniqueness of the dish, Yuji whisked away our empty bowls and replaced it with two delicate packets of ramen dough. Colored with nori, the ramen was filled with a puree of monkfish liver and topped with fresh grated wasabi. Known as the foie gras of the sea, the monkfish liver was certainly rich. The fresh wasabi broke the buttery liver and added a bold punch. And for the last ramen dish of the night, we were treated to something of a hands-on experience. 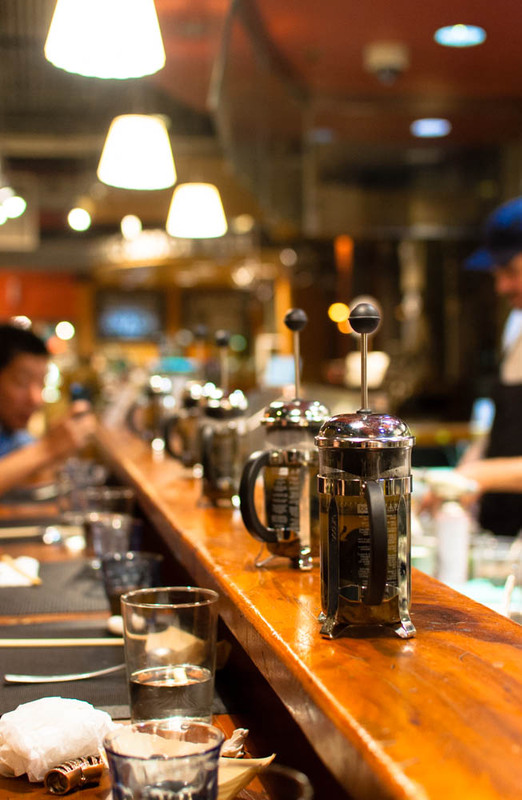 To start, everyone was presented with a miniature french press filled with mussel shells that Yuji had smoked using a mini hand torch for a good ten minutes. 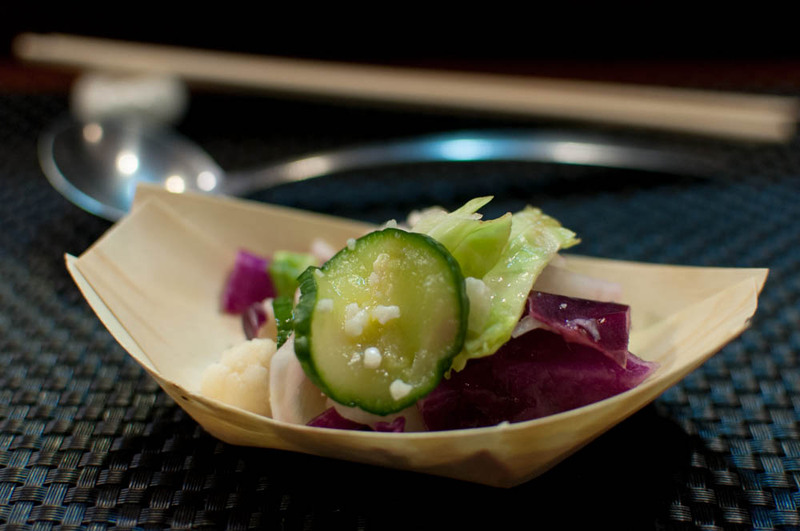 While he was preparing the shells, Yuji described how he sourced all the ingredients used in the tasting. Focused on being resourceful and sustainability, he wanted to make sure that nothing went to waste, including the very mussel shells he was smoking. After each press was filled with shells, Yuji poured in a hot broth that he made that day with all types of bones sourced from the Whole Foods butcher. We were instructed to wait a few minutes before forcing the mesh of the press down onto the shells, crushing them lightly to impart a light smokey flavor. The broth is then poured over a small bowl of ramen noodles with mussels. This, Yuji explained, was an ideal bowl of ramen to him. Unlike the typical bowl of ramen, he wanted to create a broth that was light and refreshing without being weighed down by sodium and fat. Something that he can drink every day and this certainly achieved just that desired effect. You can just taste all the different types of bones used to create the broth, all so well balanced without one overpowering another. The end result was just a lovely bowl of noodles to finish off an amazing meal. 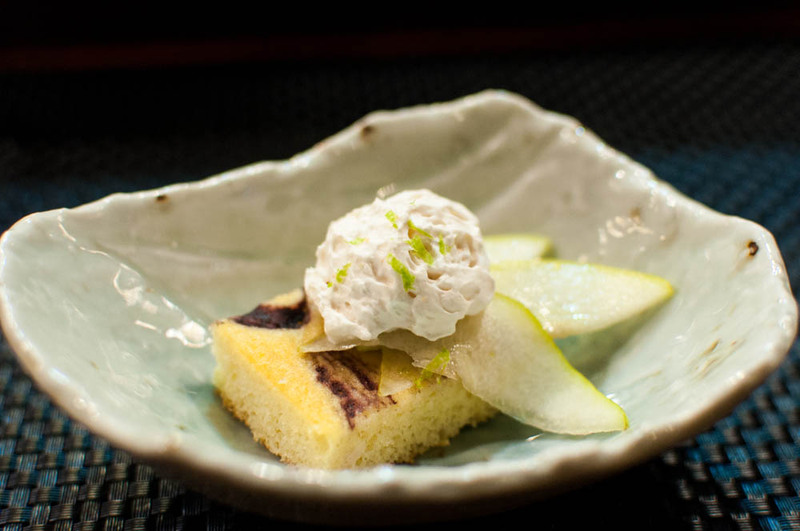 For dessert, Yuji presented us with a slice of sake sponge cake with concord grapes and carrot whipped cream and pear slices. Without a proper bakery, this was a quick and light dessert that can be easily assembled on site at the tiny kitchen. What makes Yuji Ramen so special is how he approaches the national dish of Japan with unusual ingredients in unexpected forms. Something that would not be so popular back in Japan where they take traditions and ramen extremely seriously. I am amazed at the caliber and creativity of the food that Yuji and his team of chefs were able to churn out in such a small and simple space that manages to highlight local seasonal ingredients. It really is exciting to see how the passion of one chef has grown from something so organic to a sold out destination on so many people’s lists. So what if only a city like New York can appreciate this deviant form of ramen? I am more than happy to embrace Yuji’s ramen that celebrates what is local and fresh, one bowl at a time.